Speak to the group leader in advance to find out the needs of the group- do they need resources in a different format, e.g. large print? Can the group leader help you to put the materials into a format the group are familiar with? Is there a common misconception about dementia in that community that you could address in your Session? If you think that the standard Information Session plan would not be accessible for the group, have a look at the Adapting your Session tab on your Champions dashboard. Each Session plan has top tips on delivering to the group, and look out for webinars that go through the resources in more depth. If you aren’t sure which Session plan would work best, speak to your RSO for support. If you speak another language, or have experience working with a particular group, let your RSO know, so we can offer Sessions to as wide a range of people as possible. If you are talking to an organisation who would like an Information Session but you don’t have the language skills or experience working with that group, pass the request on to your RSO so they can try to find someone to deliver the Session. If you are delivering to an under represented group, encourage them to think about becoming a Champion, so that we can reach as many people as possible. If you don’t feel confident delivering to a particular group, consider delivering with another Champion. Speak to your RSO if you would like to be linked up with someone to deliver the Session. Find out about local information and support that may be available for that community or group. Alzheimer’s Society has lots of targeted resources that you could signpost to. Remember that Champions are not DBS checked. If you would like to deliver to children and young people or vulnerable adults, make sure there is another adult in the room with you. No action is too small – It is important that all members of the group feel that they are able to commit to an action. 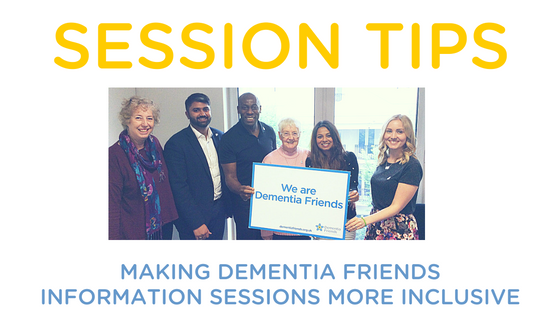 You could suggest actions such as wearing your Dementia Friends badge, telling one person that you have been along to an Information Session and being patient if someone is struggling. If you feel that the Dementia Friends pin badges may not be appropriate for some members of the group, please speak to your Regional Support Officer in advance about placing an order for some Dementia Friends stickers. If someone is having difficulty with reading and/or completing their action mailer you could quietly offer them some support. Think about which mailer would work best for the group- would the easy read or the free text mailers work better? Alternatively you could ask the group to tell you their action and you could write it down. If you have a top tip for making Information Sessions more inclusive, let your RSO know!